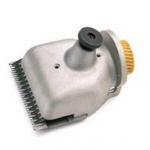 This is the head only to convert a sheep shear Heiniger Xtra 320w to a cattle / horse clipper. This does not come with any blades. To make the change you unscrew the sheep head and then using the same screws attach the cattle head. Easy!